Seems like I ran out of my luck. I have to try to debate factory/assembly defect with Nippon-Yasan's infamous customer service. 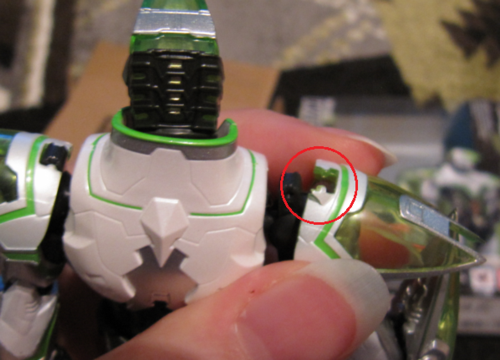 His right shoulderplate's peg is broken fresh from the box. Ironically it's the one with Figuarts sponsor text. KiraYamato44 (4 vuotta sitten) #2369705Has anyone received any in stock-shipping notification from NY yet? Nope. They've marked release on Sept 29th. I'm not sure what's going on with them. These did release on 19th elsewere, right? EDIT: Oh cool, now Nippon-Yasan sent out those mails. EDIT2: This is even cooler, I already received him. Airmail was really fast for him. I wonder where my Barnaby is going at. Has anyone received any in stock-shipping notification from NY yet? I'm waiting for NY as well, but today all the stores are closed. Maybe they'll post him up by the end of this week. They posted Bunny really quick, so this waiting is killing me. Hopefully, NY will put him up for pre-order tonight. I'm going to cross my fingers. There are enough differences on this to make me want this. NEED. gekijouban tiger & bunny -the rising-?